Le Labo is the new fragrance line, the originality of which consists in the fact that the fragrances are mixed when you purchase the scents (maturated essential oil is mixed with alcohol and water). The most exciting aspect of Le Labo to me is the perfumers who created the maturated oils: Alberto Morillas, Annick Menardo, Daphne Bugey, Frank Voelkl, Françoise Caron, Michel Almairac, Mark Buxton, and Maurice Roucel. Jasmine 17 is one of the two Roucel’s creations for the line (you can read my review of the other scent, Ciste 18, here). Jasmine 17 was meant to be “a modern alternative to the old-fashioned traditional floral signatures.” According to Le Labo, “the short formula” gives Jasmine 17 “such a distinctive character that once you wear it you’ll never forget it”. I am not entirely sure about the “distinctive character”. 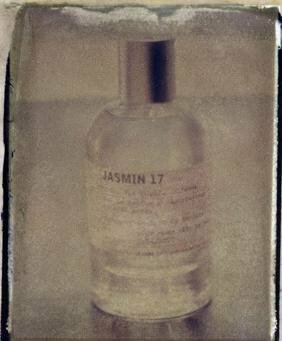 Jasmine 17 is yet another variation on the “floral and vanilla” theme, and even though the rendition is subtle, delicate and truly lovely, once again I am reminded of a host of similar fragrances, among them Black Orchid by Susanne Lang and even, in a way, Songes by Annick Goutal. Jasmine 17 is more understated than either and has a certain genteel, quietly feminine feel to it. 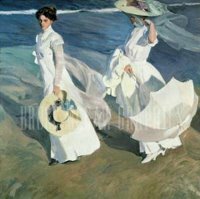 The scent seems to be asking to be worn with a flowing white dress, lace gloves and a white umbrella. As for the notes, jasmine and orange blossom are most prominent to my nose, accompanied but never overshadowed by the ubiquitous vanilla. The fragrance does not undergo much development on my skin, yet there is a lot of charm in this seemingly simple blend. Jasmine 17 is perhaps not big bottle worthy for me, but I might obtain one of Le Labo’s 15ml bottles, wear the scent in summer and feel like a refined, gracious lady from the 1900s. Jasmine 17 is available at Le Labo boutique, $45.00-$180.00. * The image is from Lelabofragrances.com. The painting is Walk on the Beach by Joaquin Sorolla y Bastida, from Easyart.com. I just fell head over heels in love with the Jasmine fragrance.I agree that it stayed fairly linear but it smelled so fresh and light without ever becoming headache inducing.I dare say that I love this as much or more than the A.Goutal Songes!I'm so glad that this worked out for you too even if it's the small bottle you want,lol!Thank you so much for reviewing one of newest loves! This is one of the easiest jasmines (florals in general really) for me to wear. It was so...light as you said and easy-going :-) I definitely need a bottle, even if it is a smaller one. Need to try the jasmine again, but guessing it will not be my favorite from the line. Very pretty & wearable though! Exactly. That's what I thought too. Pretty and wearable, but not exactly my favorite. Huh, will have to see if Patty got some of this! She better send us that other one, the Doctah Doctah. SHould I be hanging my head in shame? Hey, do you have any comments on her reveal that you want to post tomorrow? Why should you be hanging your head in shame, March?? I am a sucker for Jasmine so I guess I should try these labo labo things everyone's been writing about. I did end up liking Songes, though, so maybe that will fit the bill for this JASNILLA type this season. P.S. I cited one of your old reviews today! Oh my goodness, that is such a great word, Jasnilla!! Can I use too, please? It describes the trend perfectly, and this Le Labo scent in particular. Jasnila!! Do you think I would like this one? I do like Jasmine generally. I think I'm holding Doctah hostage until someone puts some lime in my coconut. There, I've peaked by quoting Harry Nilsson lyrics in a blog comment. I think I would love this one because I adore all the white flowers, aspecialy the indolic flowers like orangeblossom, tuberose,gardenia and jamsine. I think you will like this one then, however, on my skin, there was no indolic-ness in Jasmine 17. Jaznilla might be a snappier spelling. I bought the rights to that in ought five. harhar.